A couple of weeks ago I purchased an AT&T USBCONNECT 881 3G card and have been doing spot bandwidth tests where 3G is available. The 3G iPhone will use the same network so these spot tests will be a good indicator of the kinds of bandwidths we can expect. 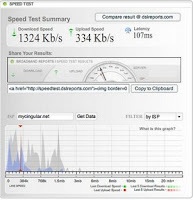 You can see my speed test results by location linked here. Coverage and bandwidth has been good so far in areas where I spend time including out on Cape Cod in North Truro, MA. On the left is a screen shot (click to enlarge) sample - 1324 Kbps downstream and 334 Kbps upstream in the wilds of the Cape Cod National Seashore - pretty good for a PC and would be very nice on a new 3G iPhone! The original iPhone runs on the 2G networks using a technology called EDGE. Despite the slower speeds, the data usage on AT&T’s mobile network ballooned due to the original iPhone. According to Chetan Sharma, our favorite mobile data guru, iPhone users used nearly five times the data used by average AT&T subscribers, and nearly twice as much as other smart phone owners. About 55 percent of the data was carried on Wi-Fi networks, while the rest was on EDGE. 3G bandwidth on a small handheld device..... sounds very nice especially for YouTube and other mobile video applications. YouTube does run on the original iPhone over the EDGE network but it is slow. As a result, most are only watching YouTube videos on their iPhones when they are within WiFi range. If users can now watch elsewhere - will mobile video become a 3G bandwidth hog? I think so. I'm also interested in how AT&T will handle the inevitable BitTorrent iPhone file-sharing applications (these are much bigger bandwidth hogs) that will be rolling out this summer. The AT&T 3G service I purchased for my PC card has a monthly 5 Giga-Byte (GB) data "soft cap". Will users get cutoff for the month when the 5 GB cap is hit? It's not just AT&T that's going to have to deal with these issues - they'll just likely have to face them first with the 3G iPhone.....Verizon and Sprint also have similar caps in their 3G wireless contracts. Interesting to know the details of the network usage. Thanks for sharing that. Very cool that there is excellent coverage in North Truro. Looking forward to upgrading to a 3G iPhone someday. Also, thanks for having me at the RTC. That was a joy and pleasure to present there. Break a leg with your projects!